Its late. A layer of thick black paint covers the area around my eyes, including my eyelids. I add black streaks that run from my eyes down my cheeks. In 1976 there aren’t a lot of product options for hair. I borrow a can of cheap hairspray and go to work. Last touch. Two more black streaks, starting at the corners of my mouth, are extended down to my chin. A look in the mirror reveals a hideous image. Excellent, I have just shocked a man on the college football team who is an inch taller than me and 40 pounds heavier. In 1976, Alice Cooper, the rock star whose look I am emulating, was both shocking and a bit frightening. Rather than playing louder, he and his band brought the horror genre to their stage show. The Prodigal Son has taken different personalities throughout time. Rembrandt, James Tissot, Salvador Dali, Stephen Baldwin. Alice Cooper, is my favorite prodigal. Yes, the man who helped pen the lyrics to Schools Out is born-again. Like me, he was raised in a pastor’s home. Like me, he lived the parable of the prodigal son. 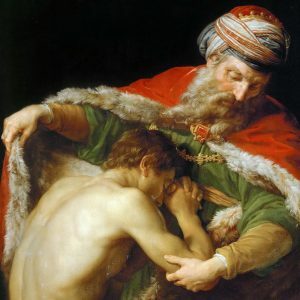 In this series of blogs we look at prodigal sons, the artwork of prodigal sons, and reflect on our loving Father. The image shown is from a painting by Pompeo Batoni entitled The Return of the Prodigal Son. Note the cross structure and the use of red in the composition. Note also the sense of repentance in the son’s posture.